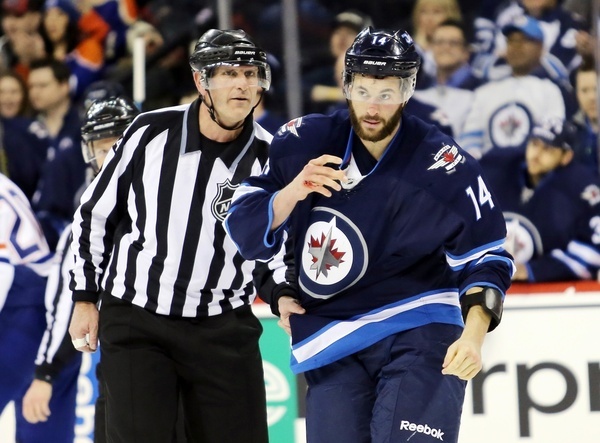 The Winnipeg Jets have agreed to a two-year pact with fourth-line enforcer Anthony Peluso, the club announced on Wednesday. The club also disclosed – and good on them for doing so – that the deal is worth $1.35 million in total and carries an annual average value of $675,000. Peluso, 26, was a pending restricted free agent and the contract that he’s signed will net him $40,000 dollars more than the value of his qualifying offer (which he’ll no longer get or require). Though he’s a replacement level offensive contributor with limited defensive value, Peluso is an imposing physical presence. A bona fide heavy weight, Peluso has fought 14 times over the past two seasons, and has amassed an impressive 10-3-1 win/loss record, according to hockeyfights.com voters (with his losses coming against serious chuckers like Tom Sestito, Brian McGrattan and Matt Kassian). In every way Peluso is a throw back. The one-dimensional enforcer has been weeded out of the league over the past couple of years (and the presence of such players dramatically fell off over the past 10 months or so), and Peluso certainly fits the bill as that sort of player. He doesn’t contribute to special teams, he never sniffed the Jets lineup in the playoffs, and he played fewer than six minutes per game on average last season. One final thing to note about Peluso is that he took penalties at an extremely high rate during hte 2014-15 campaign, exacerbating a significant team level issue for Winnipeg, which was the least disciplined team in hockey. In his first full NHL season though Peluso managed a positive penalty differential, so maybe he can bounce back a bit in this arena. Otherwise he’s a complete liability at the NHL level, even if he rarely sniffs the ice. The good news is that Peluso’s contract is cheap enough to bury in the minors without it impacting the Jets’ NHL books. Perhaps that’s part of the plan, actually. If Peluso is signed to a relatively expensive one-way contract (by AHL standards), then he’s a safe bet to make it through waivers. That would allow him to provide the Jets with NHL-level depth (albeit of a low quality) while also being able to go down and protect Jets prospects in the AHL with the Manitoba Moose – a league where the enforcer is still very much a thing – and maybe help the Jets save some daily cap space in the process. Who Are Your Jets Trading Chips?